Game Recap: @OHLBarrieColts drop Game 2 to @OHLBattalion 3-2. #OHL #Playoffs - Very Barrie Colts | A website covering the Barrie Colts of the OHL. 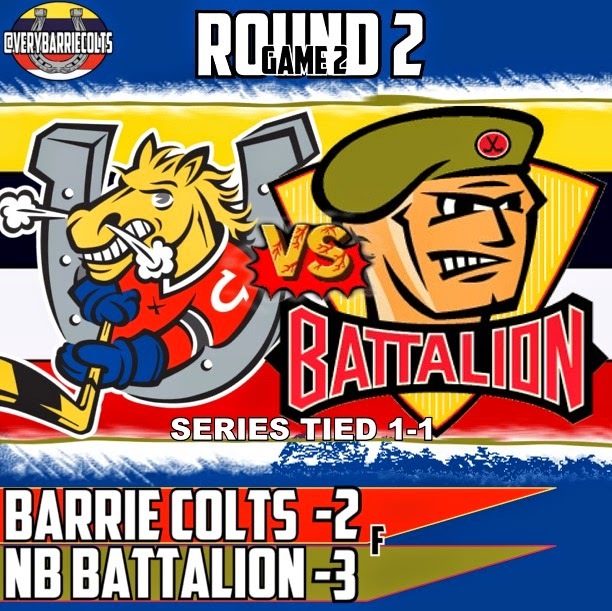 Last night the Barrie Colts dropped game 2 to the North Bay Battalion in a 3-2 loss. With the win, the Battalion will bring the series to North Bay tied 1-1. 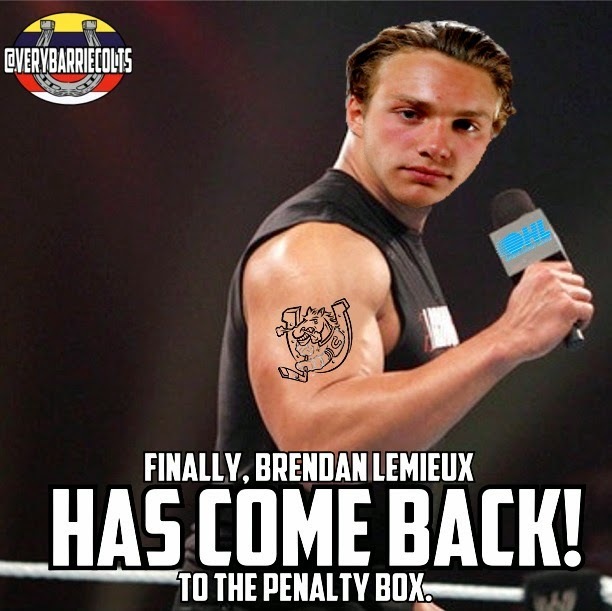 First Period: Brendan Lemieux made his return back to the lineup in game 1 and last night he made his much anticipated return back to the penalty box. At 3:53 he would get called for slashing and North Bay would make them pay. 46 seconds into the penalty, Kyle Wood would score from the top of the circle for his first of the playoffs to give the Troops a 1-0 lead. Blackwood had no chance seeing the puck through the 2 Colts and 1 Troop in front of him. A little over 10 minutes later the Troops would strike again when Ray Huether would score his first of the playoffs with the assist going to Brett McKenzie. Chadd Bauman had the man in front of the net but Ray was able to walk right through the blue paint to wrap the puck around Blackwood to score. The Colts would go on the power play shortly after the goal but were unable to capitalize. The period would end with the Troops leading 2-0. North Bay had the edge in shots 11-10 through one. Second Period: The second started with both teams playing 4 on 4 following Henriksson and Laser both going to the box at the end of the first for roughing. 1:25 in the period Brendan Lemieux would score his first of the playoffs to cut the Battalion lead in half. Joseph Blandisi would be credited with the only assist. Lemieux was stopped on his initial shot but was able to regain control of the puck behind the net where he would bank it off of Jake Smith and in. 2:21 seconds after that, Roy Radke would score his second of the playoffs to tie the game at 2-2. The Colts would kill off the 5 on 3 before the third period would end with a 2-2 tie. Troops out shot Barrie 13-8 in the period. Third Period: 3:19 into the period the Colts would get a chance on the power play. Not even a minute in the Colts would lose control of the puck on the rush and got caught going the other way and Nick Paul would make them pay with a hard wrist shot on Blackwoods blocker side. The goal was unassisted and would give the Battalion the 3-2 lead. And that would be enough to get the win. The Colts were out shot again 10-8 in the period and 34-26 on the game. Though there were lots of bad penalties, the Colts need to learn that the Refs are (mostly) calling everything. That is where it gets confusing for players, the (mostly) part. There were a few trips and interference calls missed and you could see where the Colts were getting frustrated. The Colts will need to learn to let that slide. Though a bad call, Blandisi's penalty was his 4th minor penalty in 2 games. Brendan Lemieux has made the score sheet in both games since returning. The Colts were 0-4 on the power play. In each game Barrie has allowed a short handed goal. Labanc, Blandisi and Lemieux were all had a minus +/-. Game 3 is Tuesday, April 14th in North Bay. Follow us on Twitter for in game coverage here. Will post game pictures so add us on Instagram here.